Come explore the beautiful islands with us! 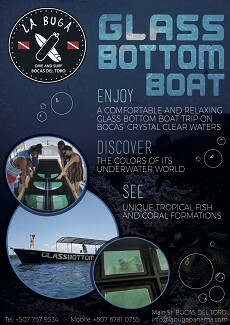 Our Glassbottom boat is one of a kind, the only Glassbottom Boat in Panama. We can offer trips towards Dolphin Bay or towards Starfish Beach. There are two stops for snorkeling in shallow spots and maybe on the way there we can spot some sloths. Price is 35 USD for about 3 hours. Feel free to bring your own snacks and drinks! (Min. amount of people is 4). Would you like to rent the boat for a full day, a private trip or you want to go somewhere else? Send an email to and we can discuss the options.